If you are coming from Judy's blog you are heading in the right direction. This month we are showing off ideas using the new March Stamp of the Month called Floral Happiness. This set of 16 stamps are perfect for our clear acrylics- They are so easy to overlay images!! 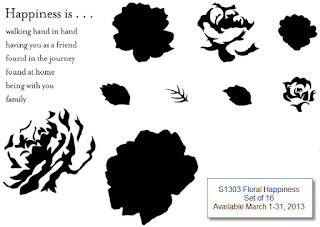 Get the Stamp of the Month set for just $5 (S1303A) when you place an order of $50 or more. I decided to try the set out on our new muslin bags... wow is it EASY to stamp on these with our regular dye based inks... LOVE them! Just fill it up with some treats or a special gift and voila! A cute little gift. Now head on over to Nikka's blog to see what she has done with the set! Your bag turned out so cute! I love the bag! Great work w/ the stamp too!